The Phantom Demo was released by Amiga/PC crew, Arkham who (for me) seemed to appear out of nowhere only to disappear once again into their natural cold habitat. This is actually two different party releases from 1993/4 bundled together and features super duper visual effects and fantastic chiptunes by Kane Wood. I enjoyed this a bunch!! Top Banana is a vertically scrolling platformer not too dissimilar to Magic Boy or Rainbow Islands. Ignoring the stupid eco storyline, this certainly has an unusual mix of weirdness and even begins with a tripped out acid-style intro reminding me of Grotesque and Aciid Burn (Whattaheck). Well, a little, but it's in stereo and worth watching once. This is a fast playing platformer which is both enjoyable and easy to control using the keyboard. Yep, I couldn't use my joystick but the keys work rather well guiding our little goth girl through the tricky levels. 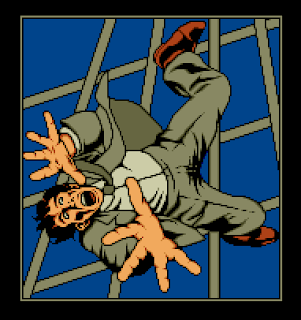 Gameplay is simple, we start near the bottom of the screen and must leap across the platforms to reach the top and avoid the rising water levels. Along the way are many unusual nasties to kill and our weapon appears to be love itself which delivers a fatal kiss of death to anything dumb enough to get in our way. So take no prisoners and enjoy killing everything!! Graphically, this is so incredibly unique but also very "busy". At first, I didn't like it and felt the screen was too cluttered as I struggled to see some dangers lurking amongst its visual mess. After a few more games I had got over that and actually found myself admiring the rough and abstract styles but mostly for daring to be different. 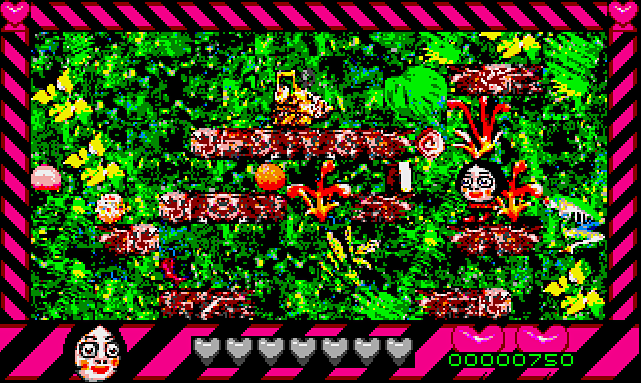 Interestingly, Top Banana is one of the few games which supports both the Atari ST and STe. The oldest computers (without Blitter) have a plain background and the usual chip sound effects but the later ST's (with a Blitter/socket) feature two-layer parallax scrolling albeit with the same sounds. The Atari STe gets the same visual enhancements plus DMA stereo music and in-game samples. However, whether you enjoy these samples is debatable. I did. Top Banana is certainly unusual and offers up a fun challenge but I don't think it's anywhere near as good as the previously mentioned games. However, I do fear it's also a much underrated because it's a great alternative to play one quiet afternoon which is exactly what I'm doing today. Finally, kudos to Hex for supporting both ST computers!! - A hard drive installable game was fudged by the D-Bug boys. 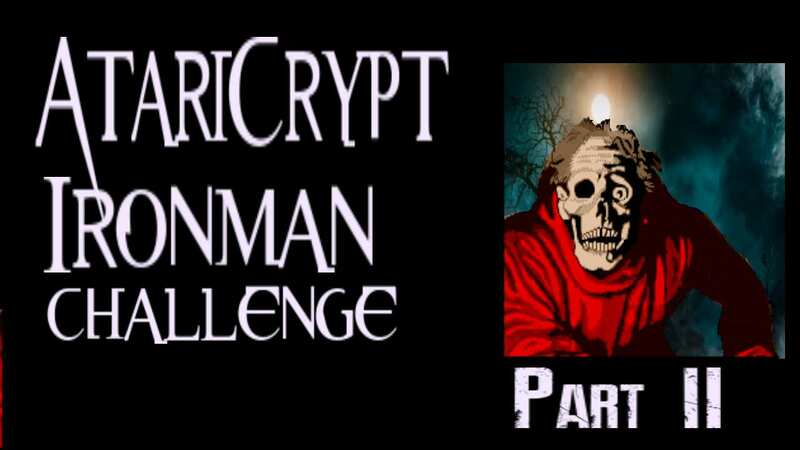 Glutton for punishment Mike of The New Retro Show has just released the second part of the Ironman Challenge. As you may remember, I gave him a list of Atari ST games which I thought would help push him over the edge. Well, he's still with us, so let's see what torture he endured for the Ironman Challenge #2. Grab the popcorn and enjoy!! It wasn't that long ago we featured Mystical here on AtariCrypt and now it takes a place within our Box Art section, thanks to a lucky (and cheap!) purchase off eBay. I am extremely pleased with this because its box is in near-perfect condition as are all of the contents too. I'm very proud to own this piece of Atari ST gaming hiSTory!! Darkman is a combination of mini-games all strung together in that Ocean style we love so much. However, the first thing that struck me was the quality of the artwork and I instantly knew this was going inside our PixelArt section. 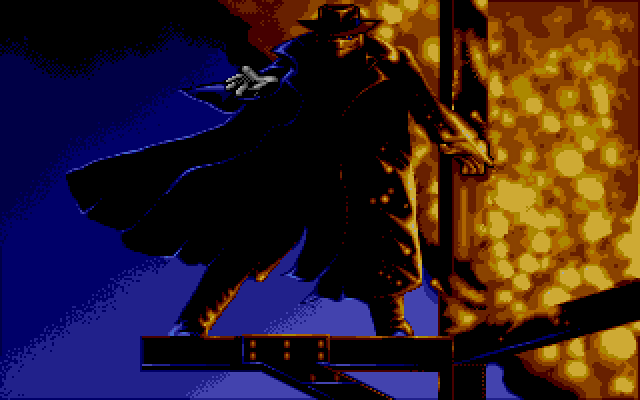 The title picture and cutscenes have a dark and mysterious theme that perfectly captures the movie's atmosphere. There are various movie scenes like dodging the oncoming traffic and covertly sneaking pictures for our disguise (which will produce hilarious results). 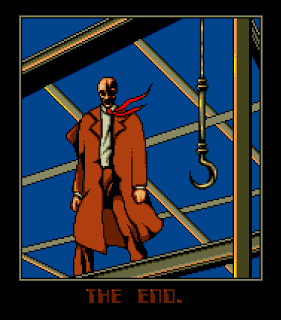 But, no matter how much Darkman tries to hide it, this is mostly) a generic arcade-style beat 'em up. Sadly, there aren't too many different moves and I noticed a few issues along the way with collision detection. 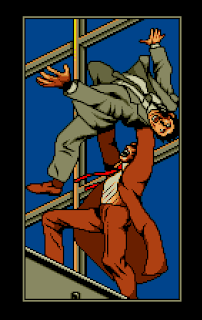 There also some annoying mechanics, and I will always hate that rooftop dash, but I admit to getting a kick out of punching Durant's hoard of henchmen which is so fast and furious with responsive controls. The artwork continues right to the end with a short comic strip showing our savage victory. Okay, it's hardly a mind-blowing finale but it's better than many other games that looped back to the beginning or simply displayed a 'well done' message. A great example of extraordinary artistic talent - and I imagine those blunt spikes must have hurt!! Darkman is far better than I originally gave it credit but it's a little rough around the edges and I don't think it plays quite as good as my personal beat 'em up "benchmark", Double Dragon 3. 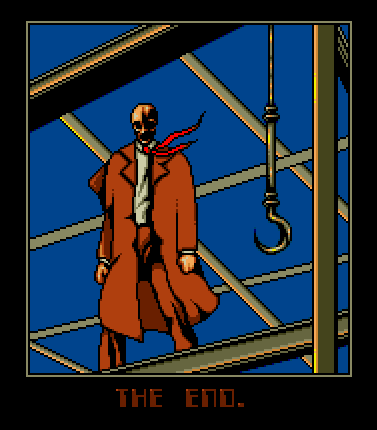 It's great fun and highly recommended but it's the artistic talent of James Clarke/Mister X that sees Darkman enter into our PixelArt hall of fame!! - Floppy disks can be downloaded off Stonish and I recommend Now 5 #7. 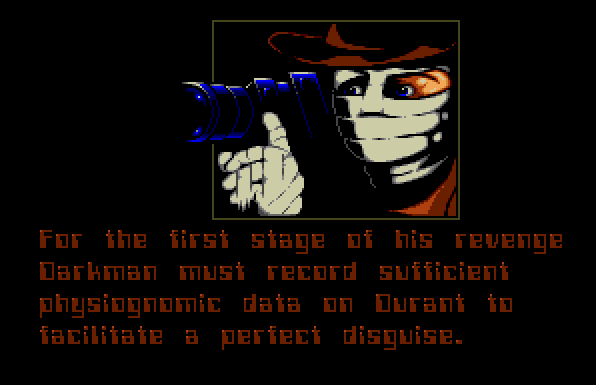 - A hard drive installable version of Darkman is available via D-Bug. 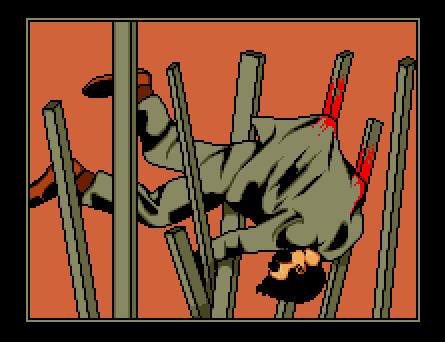 - AtariMania list the other works of James Clarke and the ominous Mister X. 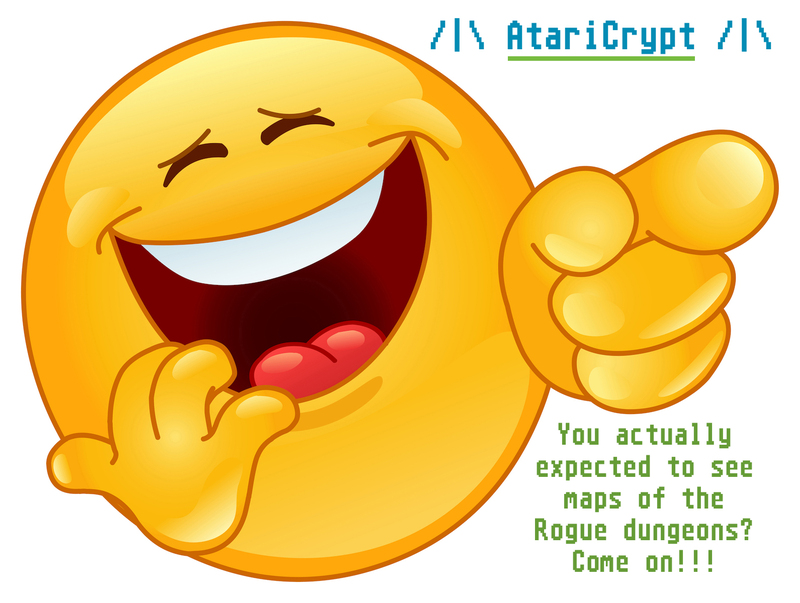 - Grit your teeth Atari fans but here are excellent maps thanks to the Hall Of Light website. Along with the crazy storyline are a few surprises like mines, hidden walls and power pad support. I love the mean-looking ghosts and our little pill-popper has a full set of teeth but my favourite is when he dies and turns into a puddle of gore. The Atari STe is used to great effect with silky smooth 50fps hardware scrolling and superb DMA audio. Is it better than Crapman? I don't know, but what I do know that we have yet another brilliant Pac-Man game!! I've always loved ElefantaSTic which was released at Silly Venture 2013 by Genesis Project. It's an amazing demo and I feel breaks away from the norm with unique and stunning styles. The artwork is superb and there are a few beautiful effects with a perfectly apt chiptune. One of my personal favourites and downloadable from Demozoo. 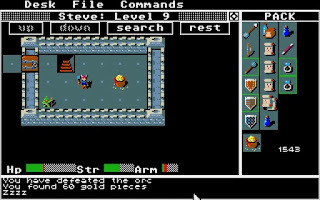 I've always had a spark of curiosity for Rogue but I also wondered why I should even bother with anything "roguelike" when I could instead crawl within the 3D realms of Dungeon Master. 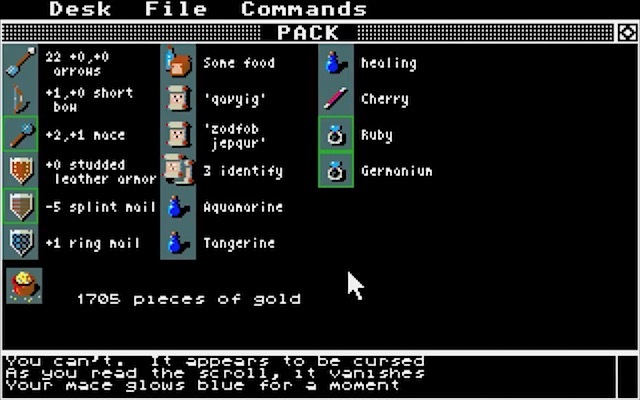 Of course, I'm being stupid because this dates back to 1980 when gamers spent their lunch breaks staring at Rogue's text-based dungeons looking for Rodney's Amulet of Yendor! 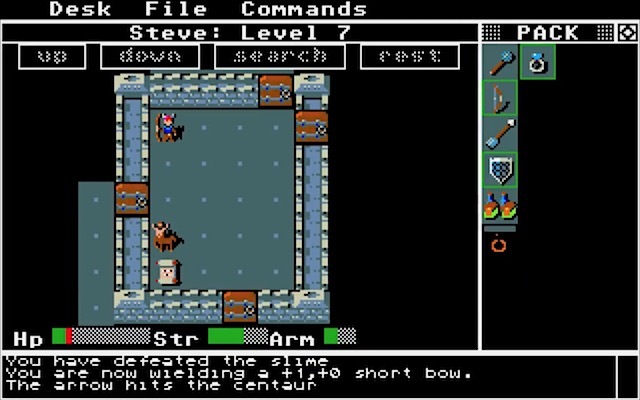 Epyx released this turn-based adventure for the Atari ST in 1986 and it's essentially the same venture through the Dungeons Of Doom but graphics have now replaced its original text interface. 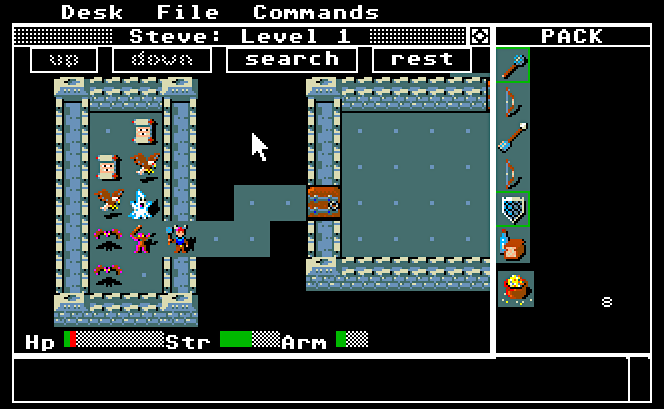 Okay, our dungeon may still look rather 8-Bit but it works perfectly to suit the scene's atmosphere and I really like it. However, for me, it's the monsters which look the best and these are superbly drawn - I love the Ice Monster the most and the Zombie looks like he's about to get down and boogie! Pressing the Enter key will zoom out to display the entire map full screen and probably favourable to the purist with its more traditional view of the dungeon. Monsters are then represented by letters, for example, B for Bat, R for Rattlesnake, Z for Zombie, etc, etc. Carefully explore each and every unique location and zoom out to see the map. 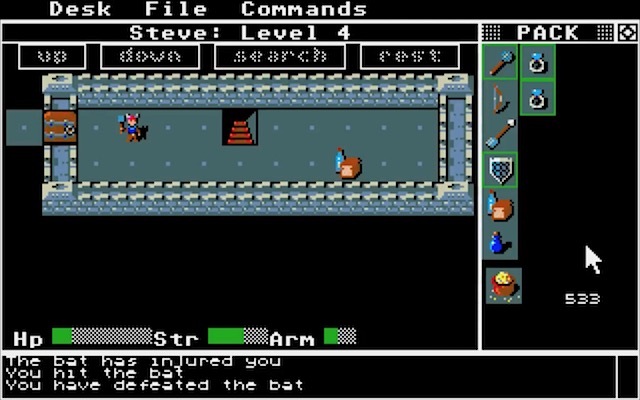 Level one introduces us to the adventure ahead and allows us to explore in relative safety with only easier baddies to contend with: like the odd Bat or Kestral. I like the ease of this learning curve as even the most novice adventurer (ie, me) will appreciate it. However, having said this, take a look at my screenshot from a recent game which I've only just begun. Wow, quite an incredible gang of nasties, I'm sure you'll agree? But this is a testament to the games ability to randomly generate an interesting experience which will always feel different. So the level maps, monsters, and items will change and you will never get the same game to play. Which is pretty darn awesome! 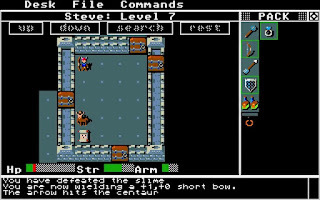 There's much more to this old dungeon crawler than slaying the funky monsters! The enemies are a wild bunch. Sure, I expected the fantasy element like Ice Monsters, Hobgoblins and Zombies, who all fit the bill perfectly. I also expected to find more traditional nasties, like Snakes and Bats but how the heck did an Emu or a Kestral find its way into these dungeons? Brilliant!! It's worth noting that not every character is immediately aggressive and it's advisable to try and tiptoe around a Leprechaun, a Nymph or a Centaur. I only wish Trolls and Wraiths had the same relaxed temperament so make sure you wear armour and chose an effective weapon. 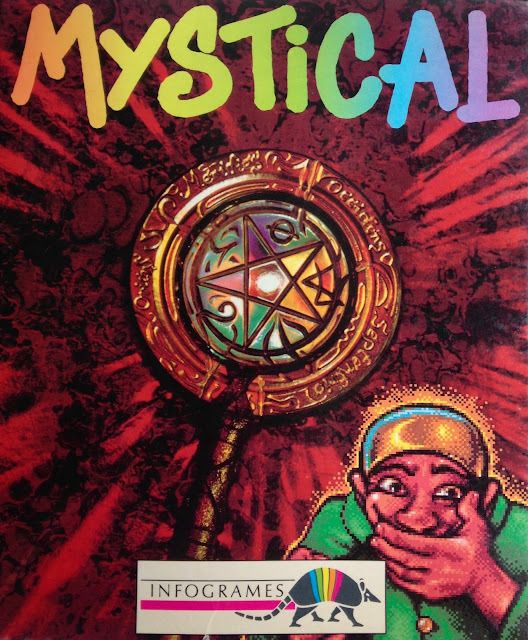 Magical scrolls and potions will perform an insane range of uses, for example, illuminating the dungeons or increase health, weapon strength, and so much more. However, not all are good so you may wish to empower yourself with the ability to identify any obscure items you may be carrying. After all, you might mistakingly conjure a demon or leave yourself blind in the darkness, but don't let that stop you from throwing these nasty objects at something creepy. It's even possible to be caught out by cursed clothing which is impossible to remove without the right spell - I travelled for five levels before being able to remove cursed chainmail. Yep, cursed clothing lol. Food is sparse down in the dungeons, which kinda makes sense, but collect what you can and only stop for a bite to eat when instructed. Some kind soul has left food but it isn't long before something appears from out of the darkness! Rogue's sound effects are pretty much authentic and that means there aren't any beyond the default clicks and dings. I wanted to record a video, but the silence was killing me, so I wondered how I might jazz it up a little. 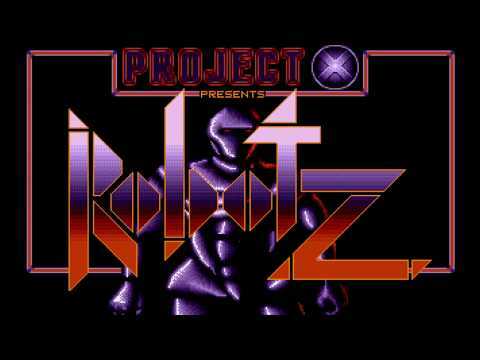 Well, Rogue is GEM-based and this means I can not only switch on the Blitter but also use ACCs and what better way to spruce up this old game than music? The STe Background Audio Player needs an Atari w/ a DMA audio coprocessor and a "hard drive" (Ultrasatan) and works tremendously well without any slowdown. Enjoy my video. Sneak by the idle old bat (insert mother in law joke) but be careful otherwise you're dead! 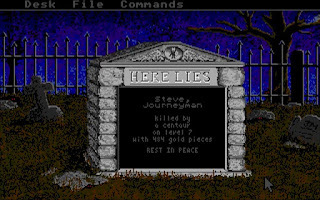 Currently, I'm exploring level 14 but it seems to have cranked up the difficulty a lot since level 9 so I admit to struggling: a Wraith and a Troll ganged up and sent me to an early grave. I reloaded only to later suffer a humiliating beating by a Quagga... Mr Rogue will need to rest so I hope nothing creeps up whilst he's vulnerable. Hang on, I've a healing potion that will help him feel better and also a spell to confuse the monsters. 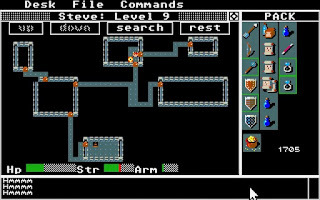 Yes, Rogue is easy to get into and very rewarding but I'm still learning the ropes of this immense turn-based adventure. I might have only scratched the surface of this historic game but I'm loving every minute of what is a tremendous experience. Play this. Now. 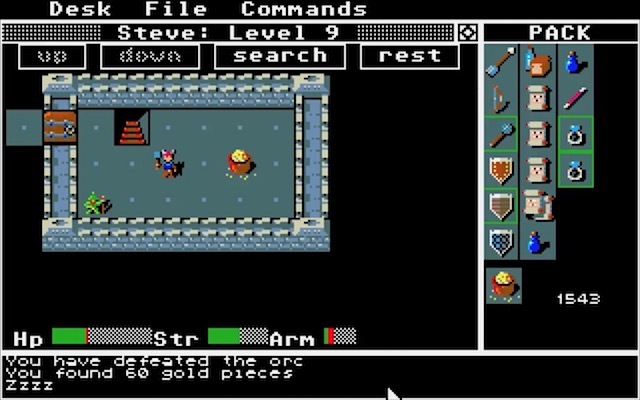 Brave adventurers can install Rogue to their hard drive or run it from floppy disk using Automation #79. Those struggling might find it helpful that I've now managed to fully map each and every dungeon - enjoy! !